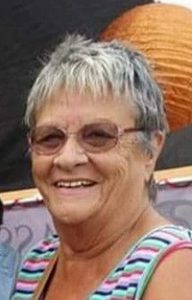 Angela Jennifer Stubbs, 76, formerly of Medicine Hat, beloved wife of the late Graham Stubbs, passed away on Saturday, February 23, 2019 while on vacation in Mexico. Upon her return to Canada, a service, followed by the placing of Angela’s ashes will be held at the Pattison Funeral Home and Hillside Cemetery, where she will rest with her husband Graham. Arrangements will be announced when completed. In lieu of flowers, donations can be made to the gofundme set up by Angela’s family to help bring her home to rest. https://www.gofundme.com/angela-stubbs-mum-medical-assisstance. To e-mail an expression of sympathy, please direct it to: pattfh@telusplanet.net subject heading: Angela Stubbs, or you may visit www.pattisonfuneralhome.com and leave a message of condolence. Our sincere sympathies to Angela’s family. She was a lovely lady and I enjoyed my time with her. She wrote a lovely story about my mom in her” Bombs to Meadowlarks” book which was enjoyed by many. Ian and I will be thinking of her up there with Graham. May all the family be blessed with many happy memories. Sincerely Ian and Veda McLaren.